Carol Stober is a multi-instrumental musician, entertainer, teacher, and recording artist. Her music covers a broad range of styles including bluegrass, country, folk, mountain music, traditional and gospel. 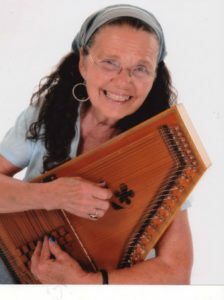 She has taught autoharp workshops, judged autoharp competitions at major festivals, performed at festivals, museums, churches, country music theaters, and theme parks. She is an Alabama solo arts council artist, conducting residencies in public schools. She was on the office staff, was a guitar instructor, and the songwriting coordinator at the The Old Town School of Folk Music in Chicago, Illinois, from 1980 to 1983, before relocating to Alabama where she has continued teaching private students. Carol graduated from the University of Maryland in 1972 with a Bachelor of Science degree in secondary education. She served on the advisory board of The Autoharpoholic Magazine and contributed articles for publication in it, as well as contributing to The Autoharp Quarterly and The Autoharp Clearing-house publications. Carol has recorded three albums/CDs with autoharp, including: Patchwork, Country Sampler, and Rebekah, Down Home Family Band (children’s songs now available on CD titled “Cyber Kid). She is currently featured on the Mountain Laurel Autoharp Cyberpluckers 2013 Christmas CD titled Strike the Harp Again. Her instructional titles include a book-CD Autoharp Instruction Set published by Workshop Records of Austin, Texas, and two autoharp instruction videos/DVDs Melodic Autoharp and Easy Autoharp for Beginners published by Texas Music and Video Company, Levelland, TX. She has authored books Appalachian Autoharp wiith a companion cassette, Cowboy Songs for Autoharp, Love Songs for Autoharp , Latin American Autoharp, and co-authored Autoharping the Gospels with Steve Kaufman all Mel Bay Publications. The books are available from Amazon.com, Mel Bay.com or can be ordered direct from Carol Stober. Her web site is: http://Autoharp.webs.com. Carol has been writing songs that have been published and recorded from the 1970’s to present and is currently a member of the Sylacauga,AL, Songwriters Chapter and the Nashville Songwriters Association International Chapter.